My great grandfather was called George Lovell ( 1836 -1904 ) and married Susan Rackley (1838-1895) and had 7 children. The youngest was my grandmother Amy Louisa Lovell ( 1879-1958) George Lovell was born in Kenton, his daughter , Amy was born in Dawlish . When Amy was about 3 years old the family moved to Teignmouth, although it's the 1891 census that proves that . Story was that George ( as head gardener ) and his family lived in The Lodge and a young Amy would ride into town with the daughter of the big house (ie Yannon Towers ) in the horse drawn carriage . Family research shows that at that time the owner of Yannon Towers was a childless woman whose name escapes me . However, as Amy's uncle William Lovell ( born 1831 ) was head coachman , it is possible that she hitched a ride with him !! Family research also shows that William and his son lived in The Lodge and that George and his family lived elsewhere in Daimonds Lane . Generations later, in 2011, we moved into Yannons Barn , which according to the then owner, John Richards , was the building used as the stable for Yannon Towers , the horse box separations still in place . The coachman was called Francis Lovell , who was 46 years old on the 1891 census , living with his son, Frank ,aged 19 , a gardener , ( in The Lodge ) It looks like Francis was married to Emma Bingham who is not mentioned in the 1891 census , so may have died by then and Francis is not there in 1901, nor Frank . George was at Bishopsteignton in 1901 , living with Amy and her husband Frank Churchill and their babies. George died in 1904. So it is possible that George was there at Yannon for about 10 years......Another little connection is that the actress Vivien Leigh was married for a short time to Leigh Holman , who was a relation through my great grandmother on the other side of the family ! Note from current owner. 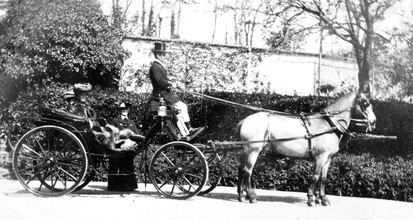 We found this picture from 1903 which may well feature Francis in the driving seat.